Preheat oven to 240°C (475°F). Using a meat mallet, pound the steaks until 2mm thick. Set aside. Place the haloumi, almond, thyme, salt and pepper on a tray and toss to combine. Place the mustard and egg in a small bowl and whisk to combine. Working one at a time, dip the steaks into the egg mixture and press into the almond mixture to coat. Place on a lightly greased oven tray and set aside. To make the creamed spinach, heat the oil in a large non-stick frying pan over medium heat. Add the garlic, salt and pepper and cook, stirring, for 2 minutes. Add the lemon rind, mustard and almond milk and mix to combine. Bring to a simmer and cook for 6–8 minutes or until reduced. Add the spinach and cook for 1 minute or until wilted. Sprinkle over the nutmeg. Set aside and keep warm. Place the schnitzels in the oven and cook, turning halfway, for 5 minutes. 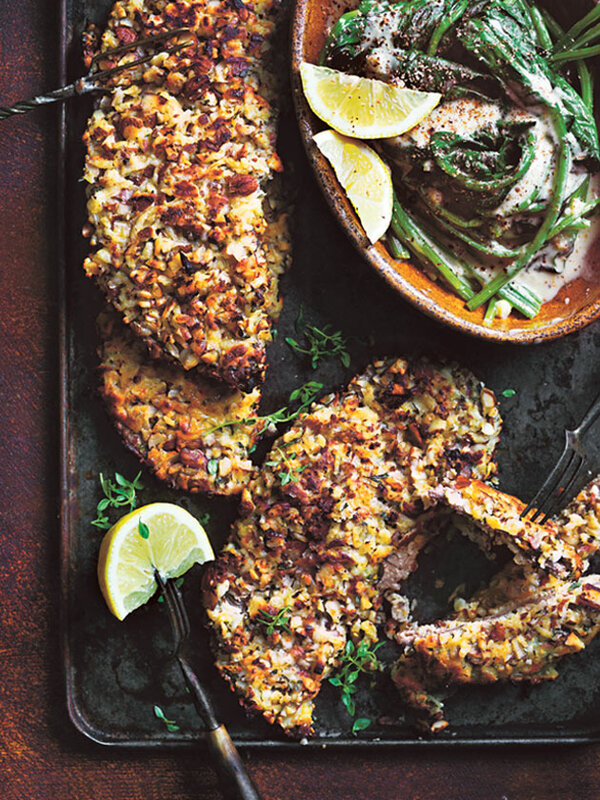 Serve the schnitzels with creamed spinach, pepper and lemon wedges. Serves 4.